By 2013, the living dead and the walki…you know, zombies, are a pretty well tread sub-genre. There aren’t many novel concepts for flesheaters and brain munchers in the 21st century, but as long as interesting stories involving these ghouls are still kicking around in writers’ soon-to-be-chomped-on heads, well then that’s okay. The Other Dead, written by Joshua Ortega and art’ed by Qing Ping Mui, looks to be a story (that will be) set during a zombie animal apocalypse (see the 2006 New Zealand film Black Sheep for more on this idea—it’s good!). There’s something about animal carnage that I can’t hang with, and right off the bat, you know that’s going to be a part of this story—but for the sake of comics, I persevere. The first thing that catches my eye is that Kevin Eastman is a creative consultant. I don’t really know what creative consultants do, but that doesn’t matter. The man is a legend, and it’s cool to see his name in the credits of this comic. 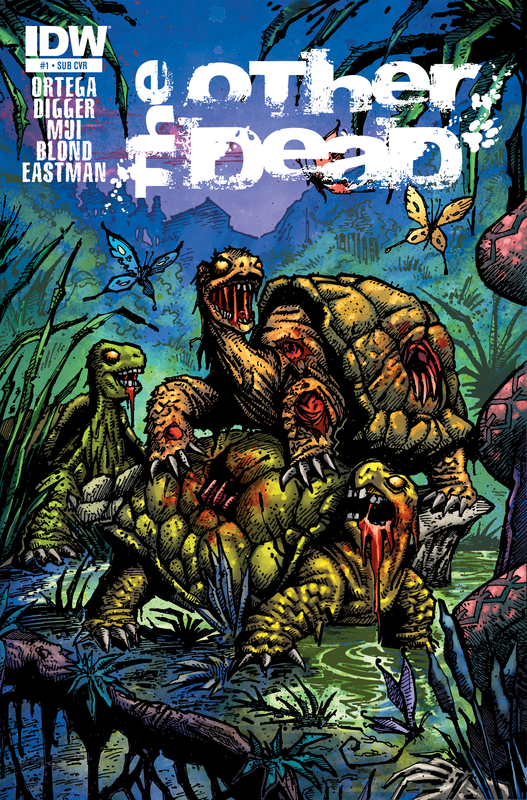 The second thing I notice is that he has done a variant cover for the book with some zombified turtles. They aren’t teenagers or mutants, just regular zombie turtles, but still—how awesome and perfect is that? But since that has nothing to do with the actual story, let’s move on (okay, let’s drool over the cover for a few more minutes and then move on). The book opens with some political making-fun-of, which I get a chuckle out of, even if the reference is a few years old now. This also serves as the set up to let the reader know that something’s kinda going on with the animals. Over the next few scenes we meet who I assume will be our main group of characters: Tommy, a young boy with some sort of crazy stomach sickness; his older brother Az, who is in a rock n’ roll band that do things that would make a 1982 Ozzy squirm; and Az’s stripper girlfriend Justina, who’s got some sort of I assume mystical Native American headdress thing she strips in. Oh, and the President of the United States. And that animal violence that makes me so squeamish? Well, there’s some, of course, but so far it’s not too bad. Keeping my fingers crossed. The Other Dead #1 is out today, September 25!